Earlier this week I happened to be visiting the Hiller Aviation Museum in San Carlos, California. 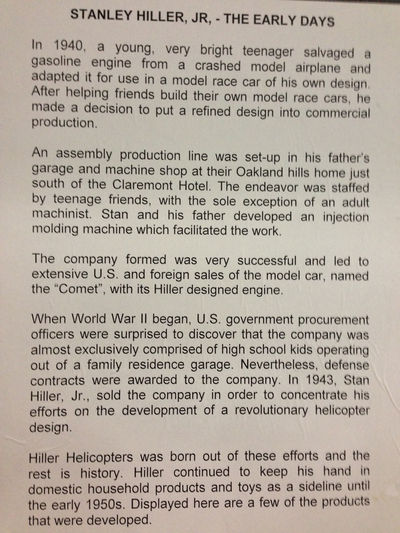 Businesses that started out in garages have been an occasional topic of FutureOfCapitalism (see here for some links), so I smiled when I saw an exhibit panel at the museum about the origins of Hiller Helicopter, which was a significant player in the helicopter business. Exhibit panel at the Hiller Aviation Museum, San Carlos, Calif.
"When World War II began, U.S. government procurement officers were surprised to discover that the company was almost exclusively comprised of high school kids operating out of a family residence garage. Nevertheless, defense contracts were awarded to the company."